I used to run a landscaping business in San Diego, mostly focusing on lawn care. Laying sod is a fun experience when done correctly. When done incorrectly, it's a huge waste of time and money. There are a few key steps detailed below that will make your project a success and ensure a thriving lawn for decades to come. When laying sod, the first step is to completely clear the area of old material and debris. This means everything—from existing grass, to large rocks, to plant roots, to old pipes—leaving nothing but bare dirt. 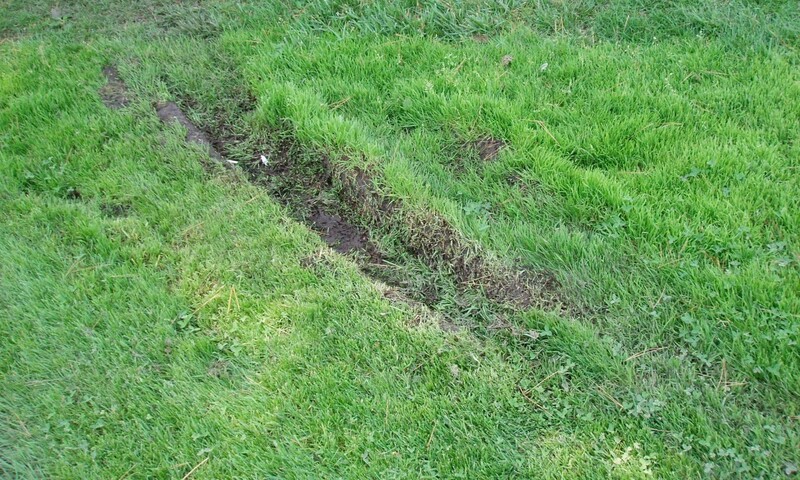 If your existing lawn has invading grass like crabgrass, you can't just skim off the top layer and call it good. 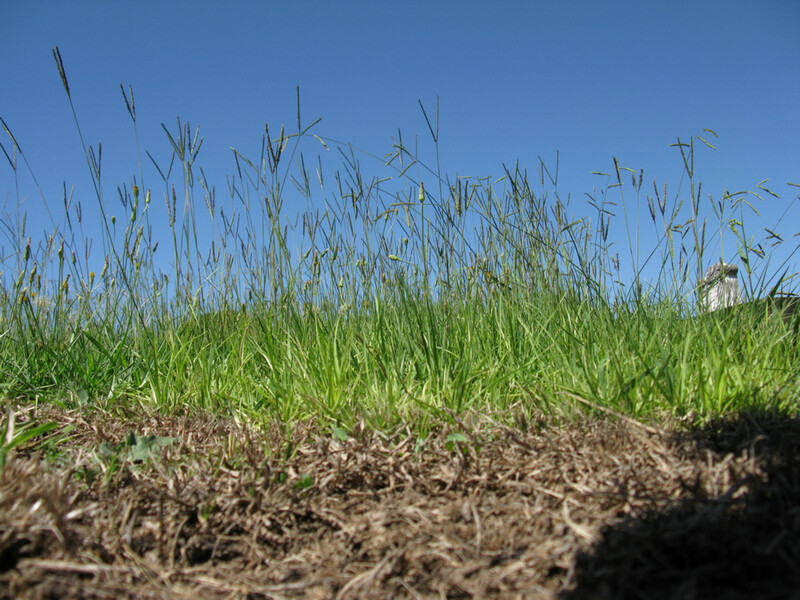 Some grasses have roots that go down up to 5 feet, so they'll come right back in your new sod. In this case, what you need to do is begin watering the current lawn for a couple of days to get it back to health. After that, you'll want to begin spraying Roundup on it, which will kill it down to the roots. You can repeat this process again to make sure the invading grass is completely dead. 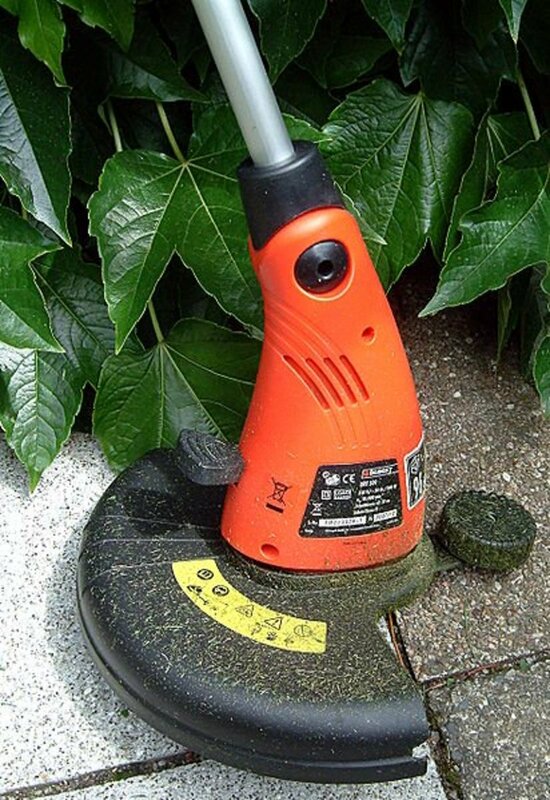 Getting rid of your old material will require either a flat shovel or a rototiller. Rototillers can generally be rented for about $60 per 24 hour period, depending on the vendor. They're gas-powered and are easy to operate. You can generally rent them anywhere that machinery is rented. 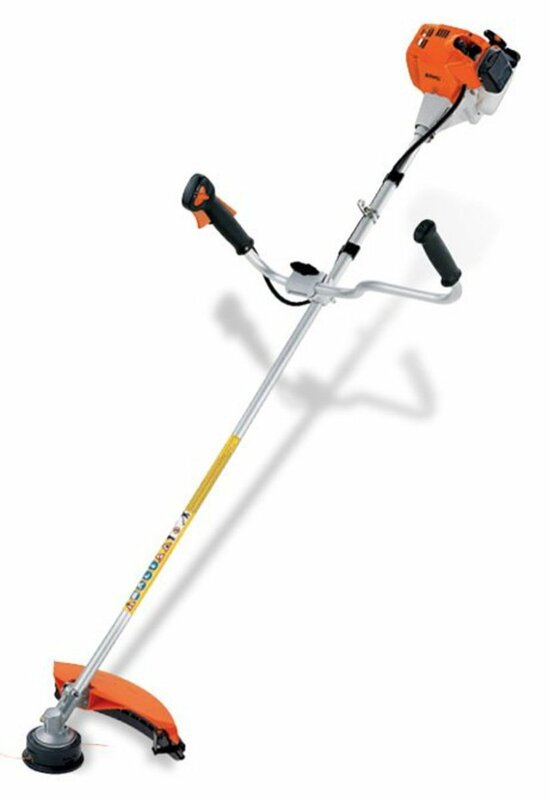 A rototiller will allow you to loosen up 3-6 inches of topsoil where your new sod is going to be laid. However, be advised: Rototilling can be a pain because it churns up all the soil, planting fresh weed seeds into the soil. To prevent new weeds from growing, add a pre-emergent weed killer to your soil, which can be bought at any Home Depot or Lowes. It won't hurt your new sod but will keep any weed seeds from developing in your newly tilled soil. Now that your soil is clear and ready to go, you'll want to level it and add your fertilizers, which are also called amendments. Amending your soil may or may not involve adding sands and gypsum to create the right soil environment for a lawn. Recommended amendments change from region to region. If you're in an area with high clay content, you'll either want to add lots of new topsoil on top of the clay, or mix in gypsum and sand to the existing soil to keep the clay from solidifying again. We'll go over that a bit more in the video. Generally, the people at your local Home Depot or Lowes garden center will be able to recommend the proper amendments for your region and soil type. Watch the video below for the full explanation of how to amend and level your soil. After your ground is level and prepared with all the amendments, you'll be ready to install your sprinkler system. I've written a full article, complete with pictures and videos, on how to easily install a basic yard sprinkler system. Even if you've never touched a sprinkler in your life, you should be able to fully create your own yard sprinkler system. If you're comfortable installing your own sprinkler system and don't need to visit my other article, just remember to install your sprinklers so that the heads are 1/2 inch above the dirt. Sod is generally 3/4 to 1 inch thick, so if all of your sprinkler heads are sticking 1/2 inch above the ground, they should line up perfectly with the sod once the ground compacts a bit. In order to get all the sprinklers to the height you want, unscrew your riser from the pipe and cut off as many sections as it takes to get the right height. Do that to all of your sprinklers. After this, you'll be ready to order your sod. You need to lay your sod in a staggering pattern so that the seams don't line up. 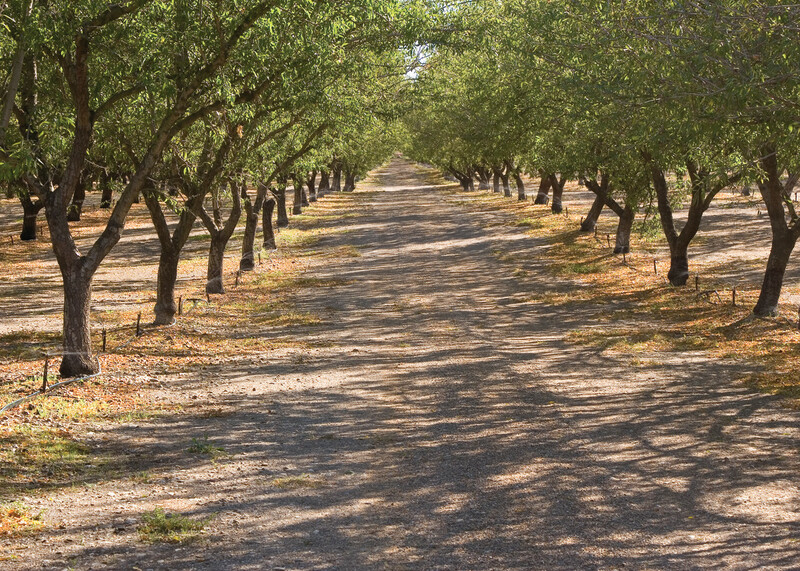 At this point, you should have your soil completely prepared and leveled and your sprinkler system installed. 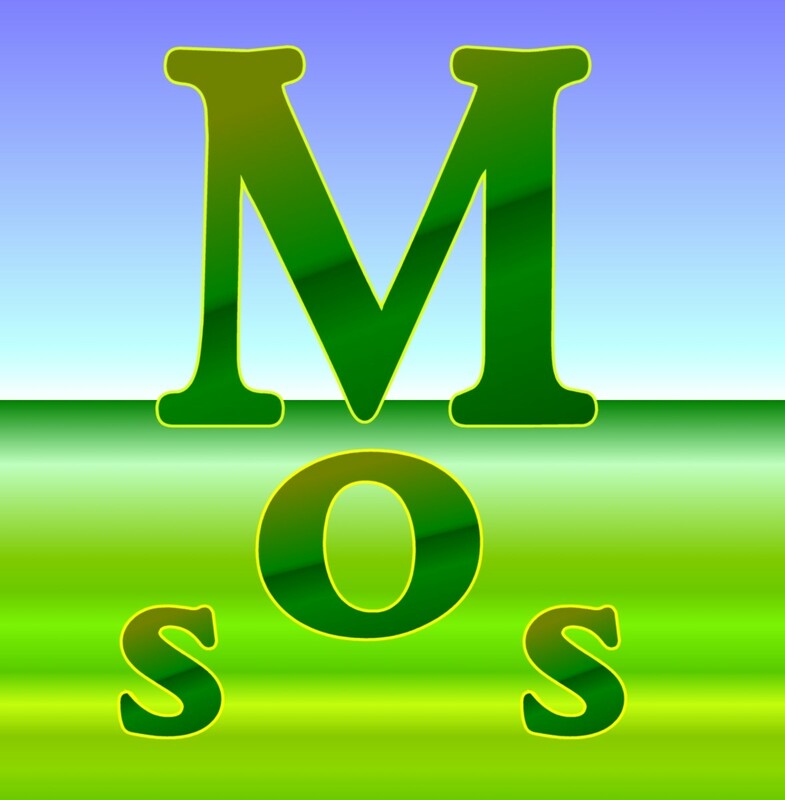 Now comes time to purchase and/or lay your sod. Your sod will arrive in strips that are generally 2 feet wide and about 8 feet long. It's recommended that you lay it immediately upon arrival to keep the roots from drying out. 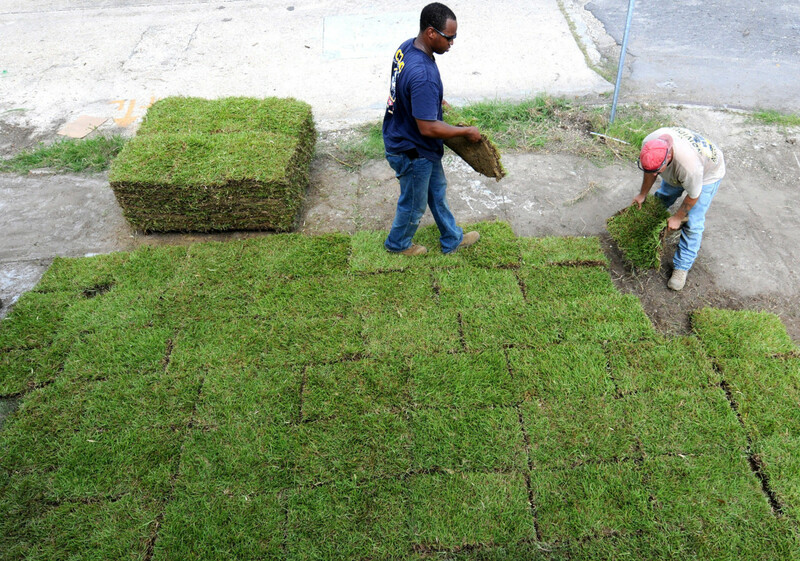 Before you begin laying sod, make sure you keep your ground nice and moist. 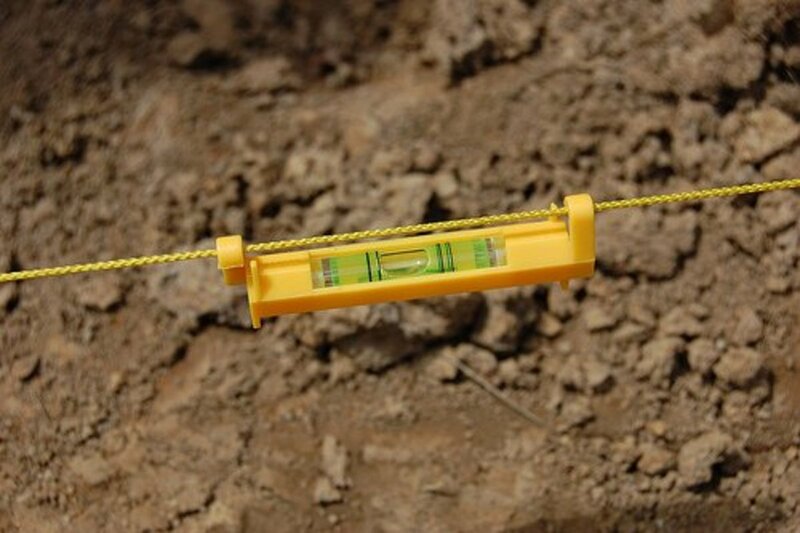 You don't want pockets of air between your sod and the ground, and you don't want the roots of your sod to dry out. Don't drench the ground. Just keep it moist. Start in the furthest corner of your yard, and go all the way across the back wall. If you have excess sod in a strip, or if you need to lay sod in an odd-shaped yard, grab a sharp knife or box cutter and trim the sod. Sod is easy to trim. You'll need to cut circles around your sprinkler heads so they can stick through the sod, and you'll need to cut the sod when it reaches the end of your yard. 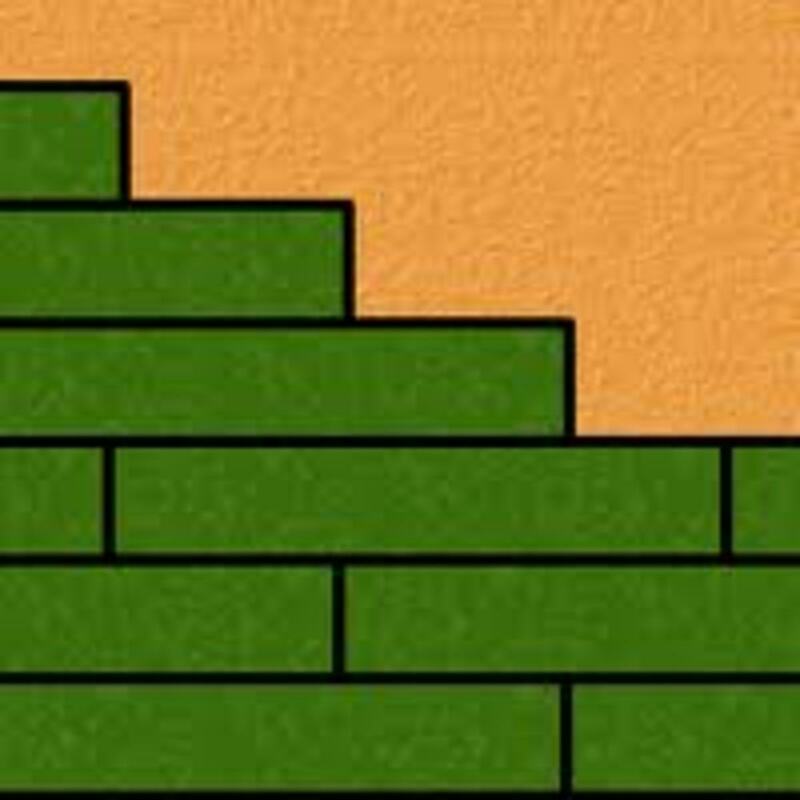 After you've covered your whole back wall with sod, start laying sod right up against the first pieces, but don't line up the seams of your sod up in straight lines. Stagger them so that none of the lines match up (see the photo above). This will help it fill in better, leaving no empty areas. Continue with this pattern, making sure to keep the ground moist as you go along. It's important to lay your sod quickly, especially on a hot, dry day. It's also important to water the sod you've just placed as you go along. Every half an hour, spray the newly laid sod for a few seconds. The final step of your sod laying experience is to use a sod roller. This step isn't completely necessary, but most people recommend it because it gets rid of any potential air pockets underneath and makes sure there's good contact between the roots of your sod and the soil beneath. 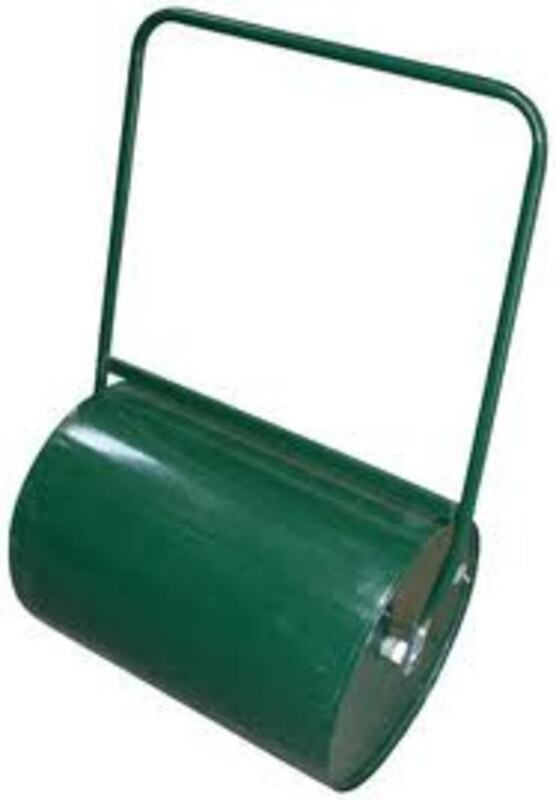 The picture above depicts a standard sod roller. Most of them are plastic cylinders that you fill up with water so that they become heavy. Sod rollers can usually be rented from the same place you rented the rototiller from. Just make one pass on the sod. You don't want to overdo it or walk on fresh sod too much in the beginning. Just passing the roller over it once should suffice. Now you have a nicely completed sod lawn! Make sure you water it at least once a day, depending on the weather conditions. 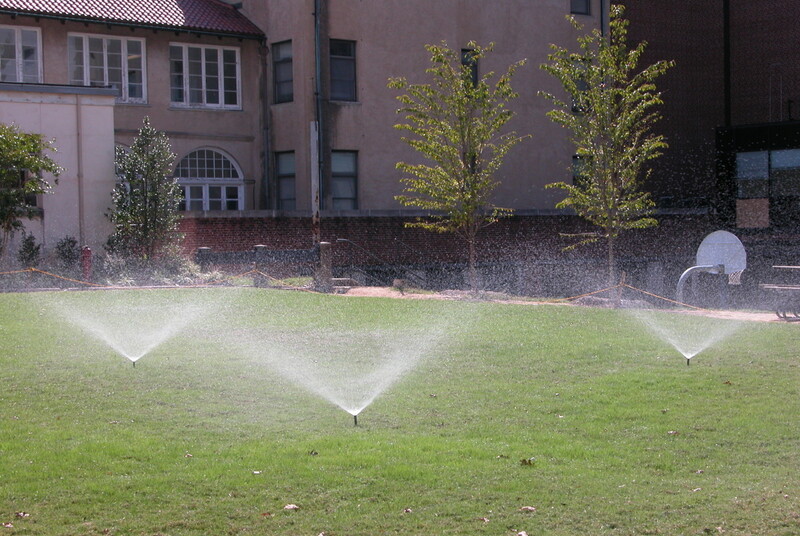 The vendor who you buy the sod from will know specifically how often it needs to be watered. I hope your sod transforms your lawn and gives you a beautiful lawn. watered the grass so I am dealing with a dust bowl. I have ordered sod to be delivered this Friday. Question : How do I till up the yard with not knowing the path of the sprinkler system ? Yeah, sod is always fun. Out there, I bet grass seed is enough though. Stuff grows like wildfire out there.